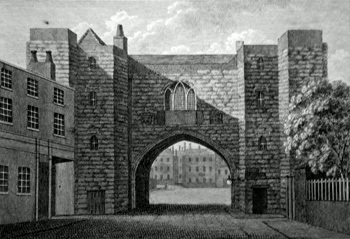 [CARTER, John, 1748-1817] : ST. JOHNS GATE 193. [London : for Robert Faulder, 1790]. 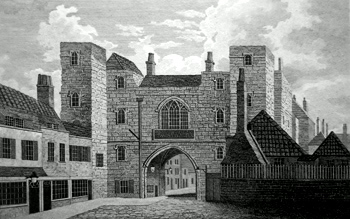 An attractive late eighteenth-century etching of St. John’s Gate by John Carter. Below the image is a display of related armorial shields. Originally produced for Thomas Pennant’s “Some Account of London”. 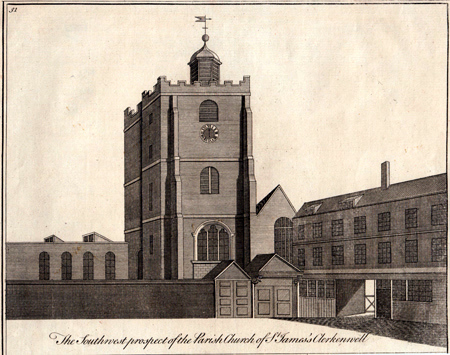 COLE, Benjamin, 1697?-1783 : THE SOUTHWEST PROSPECT OF THE PARISH CHURCH OF ST. JAMES’S CLERKENWELL. [London : for J. Wilkie; T. Lowndes & others, 1772]. A handsome antique print – an austere depiction of the old square-towered seventeenth-century church. Originally engraved by Benjamin Cole for the part-work edition of William Maitland’s “History of London” (London : 1753-1756), but here in a slightly later printing from 1772. Copper line engraving on paper. Later hand colour. Engraved surface 187 x 235mm (approx. 7-3/8” x 9-1/4”). Trimmed tight to margins, but in very good and clean state. A guaranteed genuine antique print. CONEY, John, 1786-1833 : ST. JOHN OF JERUSALEM CLERKENWELL. London : J. Booth, 1818. 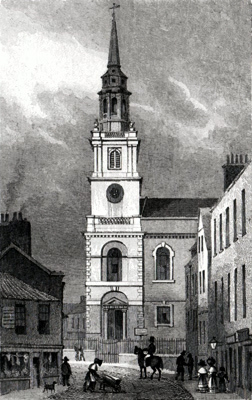 A handsome antique print – the exterior of the early eighteenth-century parish church of St. John Clerkenwell as it stood in the early nineteenth century. Engraved by Joseph Skelton (1783-1871) from an original drawing by John Coney. Originally produced for the part-work series “Architectura Ecclesiastica Londini; being a Series of Views” (London : 1810-1823) – “the first artistically competent and exhaustive illustration of the golden age of London church building” (Adams). Below the image are several lines of explanatory text. Copper line engraving on paper. Engraved surface 265 x 160mm (approx. 10-1/2” x 6-1/4”). In very good and clean state. A guaranteed genuine antique print. Adams 129/057. 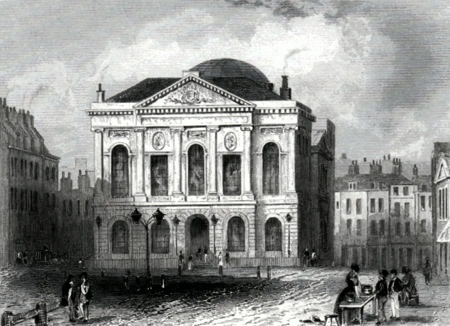 [PAYNE, Albert Henry, 1812-1902] : THE SESSIONS HOUSE, CLERKENWELL. [London : John Tallis & Co., 1852]. A charming small antique print of the Middlesex Sessions House on Clerkenwell Green. 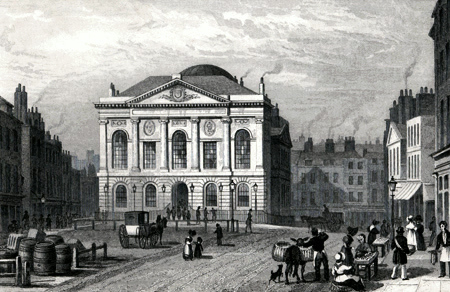 An engraving from the workshop of A. H. Payne, originally produced for Payne’s “Illustrated London, or a Series of Views in the British Metropolis and its Vicinity” (London : 1846-1847) – and here in a slightly later impression. Steel line engraving on paper. Engraved surface 70 x 85mm (approx. 2-3/4” x 3-3/8”). In very good and clean state. A guaranteed genuine antique print. Adams 207/032A. [PAYNE, Albert Henry, 1812-1902] : ST. JOHN’S GATE, CLERKENWELL. [London : John Tallis & Co., 1852]. A charming small antique print of the historic gate and the adjacent buildings. An engraving from the workshop of A. H. Payne. Originally produced for Payne’s “Illustrated London, or a Series of Views in the British Metropolis and its Vicinity” (1846-1847), and here in a slightly later impression. Steel line engraving on paper. Engraved surface 69 x 85mm (approx. 2-3/4” x 3-3/8”). A few tiny specks, but overall in very good and clean state. A guaranteed genuine antique print. Adams 207/033B. 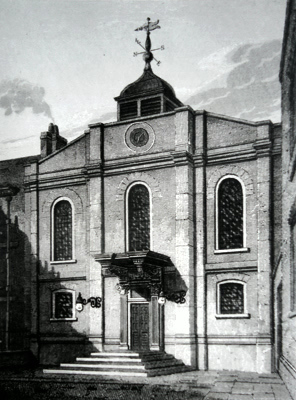 PELTRO, John, 1760-1808 : ST. JOHN’S GATE, IN CLERKENWELL, MIDDLESEX. PLATE 1. London : Alexander Hogg, . 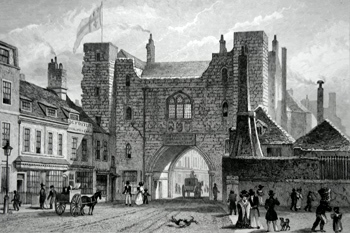 A handsome antique print – a view of St. John’s Gate from the east. Engraved by John Peltro and originally produced for Hogg’s partwork publication “Historical Descriptions of New and Elegant Picturesque Views of the Antiquities of England and Wales”. Copper line engraving on paper. Engraved surface 135 x 184mm (approx. 5-3/8” x 7-1/4”). A few tiny specks, but overall in very good and clean state. A guaranteed genuine antique print. Adams 63/015A. PELTRO, John, 1760-1808 : ST. JOHN’S GATE, IN CLERKENWELL, MIDDLESEX. PLATE 2. London : Alexander Hogg, . 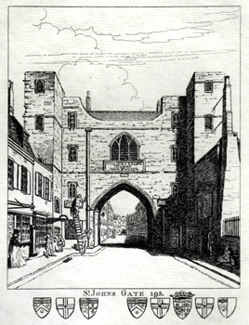 A handsome antique print – a view of St. John’s Gate from the west. Engraved by John Peltro and originally produced for Hogg’s partwork publication “Historical Descriptions of New and Elegant Picturesque Views of the Antiquities of England and Wales”. Copper line engraving on paper. Engraved surface 135 x 184mm (approx. 5-3/8” x 7-1/4”). A couple of tiny spots, but overall in very good and clean state. A guaranteed genuine antique print. Adams 63/015B. PRATTENT, Thomas : HICKS’ HALL, CLERKENWELL. [London : for T. Hughes, and M. Jones, 1805]. An elegant antique print of the old Middlesex Sessions House on Clerkenwell Green, built in 1779-1782 and here still known by the name of Sir Baptist Hicks, whose Jacobean mansion once occupied the site. Engraved by William Poole (fl.1802-1806) from an original study by the London draughtsman, engraver, printer and printseller, Thomas Prattent (fl.1790-1819), who had premises in Cloth Fair. Originally produced for B. Lambert, “The History and Survey of London and its Environs from the Earliest Period” (London : 1805-1806). Copper line engraving on paper. Engraved surface 108 x 145mm (approx. 4-1/4” x 5-3/4”). Mild creasing to lower edge, but in very good and clean state. A guaranteed genuine antique print. Adams 96/010. 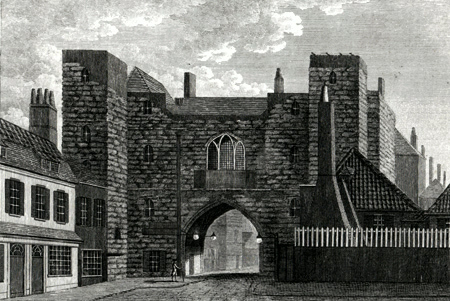 PRATTENT, Thomas : ST. JOHN’S GATE [CLERKENWELL] . London : T. Hughes, 1805. 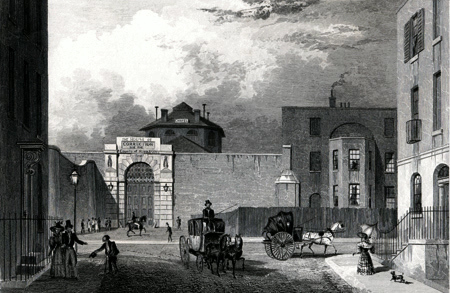 A neatly worked antique print giving a view of the gate and the adjacent buildings. Engraved by E. Shirt from an original design by the London draughtsman, engraver, printer and printseller, Thomas Prattent (fl.1790-1819), who had premises in Cloth Fair. Originally produced for B. Lambert, “The History and Survey of London and its Environs from the Earliest Period” (London : 1805-1806). Etching and line engraving on paper. Engraved surface 101 x 144mm (approx. 4” x 5-5/8”). In very good and clean state. A guaranteed genuine antique print. Adams 96/049. PRIOR, William Henry, 1812-1882 : CLERKENWELL GREEN IN 1789. [London : 1878 (or later)]. An attractive antique print – an animated street scene, with a view past carriages, barrels and pedestrians towards the Middlesex Sessions House (built 1779-1782). Engraved from a study (based on an earlier source) by William Henry Prior. Originally produced for the part-work “Old and New London” (London : 1873-1878). Wood engraving on paper. Later hand colour. Engraved surface 143 x 210mm (approx. 5-5/8” x 8-1/4”). Text on verso. In very good and clean state. A guaranteed genuine antique print. SHEPHERD, Thomas Hosmer, 1793-1864 : HOUSE OF CORRECTION, COLDBATH FIELDS. [London : Jones & Co., 1831]. A handsome antique print of the notorious Cold Bath Fields Prison, built in 1794 and demolished in 1889. The Mount Pleasant Parcels Post Office stands on the site. Engraved by William Watkins (1807-1891) from an original study by Thomas Hosmer Shepherd. From Shepherd’s part-work series “London and its Environs in the Nineteenth Century” (London : 1829-1832). Steel line engraving on paper. Engraved surface 109 x 149mm (approx. 4-1/4” x 5-7/8”). In very good and clean state. A guaranteed genuine antique print. Adams 161/169. Steel line engraving on paper. Later hand colour. Engraved surface 109 x 149mm (approx. 4-1/4” x 5-7/8”). A couple of tiny marks to margins, but overall in very good and clean state. A guaranteed genuine antique print. Adams 161/169. SHEPHERD, Thomas Hosmer, 1793-1864 : SESSIONS HOUSE, CLERKENWELL GREEN. London : Jones & Co., 1831. A delightful antique print – an animated street scene with a carriage, groups of pedestrians and some itinerant vendors. 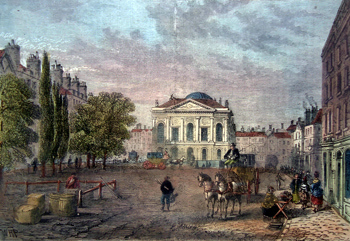 The view depicts the Middlesex Sessions House (built 1779-1782), the Green and some of the houses on either side. Engraved by Samuel Lacey (1786-1859) from an original drawing (now in the Museum of London) by Thomas Hosmer Shepherd. From Shepherd’s part-work series “London and its Environs in the Nineteenth Century” (London : 1829-1832). Steel line engraving on paper. Later hand colour. Engraved surface 106 x 150mm (approx. 4-1/4” x 5-7/8”). A few riny specks, but overall in very good and clean state. A guaranteed genuine antique print. Adams 161/097. Steel line engraving on paper. Engraved surface 106 x 150mm (approx. 4-1/4” x 5-7/8”). In very good and clean state. A guaranteed genuine antique print. Adams 161/097. SHEPHERD, Thomas Hosmer, 1793-1864 : ST. JAMES’S CLERKENWELL. [London : Jones & Co., 1830]. A small antique print of the church, a horseman riding by. 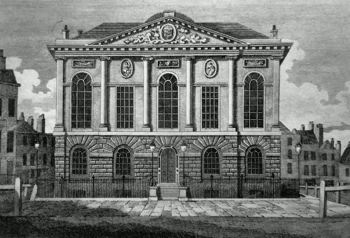 The present church, built by James Carr in 1778-1782 – seen here before the Victorian remodelling of the spire. Engraved by Josiah Henshall (1801?-1869) from an original study by Thomas Hosmer Shepherd, the master recorder of nineteenth-century London. From Shepherd’s part-work series “London and its Environs in the Nineteenth Century” (London : 1829-1832). Steel line engraving on paper. Engraved surface 112 x 66mm (approx. 4-3/8” x 2-5/8”). In very good and clean state. A guaranteed genuine antique print. Adams 161/072. SHEPHERD, Thomas Hosmer, 1793-1864 : ST. JOHN’S GATE, CLERKENWELL. London : Jones & Co., 1829. 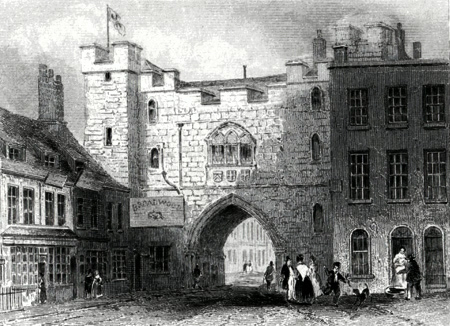 An attractive antique print – a pleasant scene depicting the sixteenth-century gatehouse, a flag flying above, horse-drawn carts and pedestrians passing below. Engraved by James Baylis Allen (1803-1876) from an original study by Thomas Hosmer Shepherd, the master recorder of nineteenth-century London. Originally produced for Shepherd’s series “London and its Environs in the Nineteenth Century” (London : 1829-1832). Steel line engraving on paper. Engraved surface 106 x 148mm (approx. 4-1/8” x 5-7/8”). In very good and clean state. A guaranteed genuine antique print. Adams 161/040. [TALLIS, John, 1818-1876 – publisher] : LADY OWEN’S ALMS HOUSES, ST. JOHN STREET ROAD. [London : John Tallis & Co., 1852]. 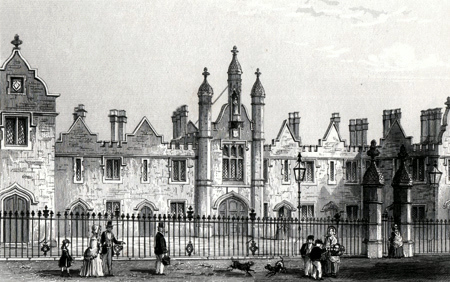 An antique print of the Dame Alice Owen almshouses, as rebuilt in 1840. Originally produced for the John Tallis part-work “Tallis’s Illustrated London; in Commemoration of the Great Exhibition of All Nations in 1851. Forming a Complete Guide to The British Metropolis and its Environs” (1851-1852). Steel line engraving on paper.Engraved surface 98 x 131mm (approx. 3-5/8” x 5-1/4”). In very good and clean state. A guaranteed genuine antique print. Adams 215/152. Return to Finsbury & Clerkenwell index page.